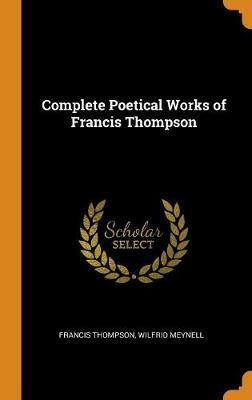 Francis (Joseph) Thompson (1859-1907) was an English poet and ascetic. He studied medicine at Owens College in Manchester but took no real interest in his studies and never practised as a doctor, moving instead to London to try and become a writer. Here he was reduced to selling matches and newspapers for a living. During this time, he became addicted to opium, which he first had taken as a remedy for ill health. He came to London in 1885 and lived a life of destitution until in 1888 he was 'discovered' after he sent poetry to the magazine Merrie England. He was sought out by its editors, Wilfrid and Alice Meynell and rescued from the verge of starvation and self-destruction. Recognizing the value of his work, the couple gave him a home and arranged for publication of his first book, Poems in 1893. His most famous poem, The Hound of Heaven (1907) describes the pursuit of the human soul by God. In addition, Thompson wrote the most famous cricket poem, the nostalgic At Lord's. Other works include: Sister Songs (1895), New Poems (1897), On Health and Holiness (1905) and Shelley: An Essay (1909). Buy Sister Songs (Dodo Press) by Francis Thompson from Australia's Online Independent Bookstore, Boomerang Books.